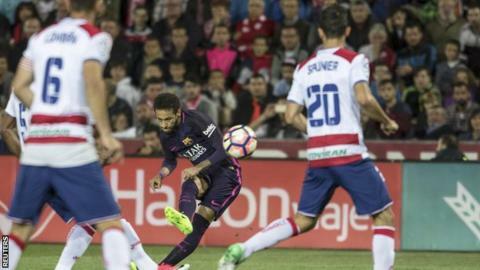 Barcelona overcame the absence of top scorer Lionel Messi to cut Real Madrid's La Liga lead to two points with a comfortable win at Granada. Luis Suarez's exquisite lob just before half-time opened the scoring before on-loan Chelsea midfielder Jeremie Boga equalised with a composed finish. Paco Alcacer restored Barca's lead before Uche Agbo was sent off for two yellow cards. Ivan Rakitic's deflected finish made it 3-1 before Neymar scored the fourth. There was pressure on Luis Enrique's side to deliver without the services of La Liga's 25-goal leading scorer Messi, who was serving a one-match ban. Real's 3-0 win over Alaves earlier in the day meant Barca started the game five points behind the leaders. Alcacer, another substitute, restored Barca's lead after a lob over the defence by Suarez before Agbo, on loan from Watford, was shown a second yellow card. Rakitic's shot was going wide before it took a deflection and found its way into the net before Neymar rounded off a highly satisfactory night for the visitors with a tap-in. Match ends, Granada CF 1, Barcelona 4. Second Half ends, Granada CF 1, Barcelona 4. Neymar (Barcelona) hits the left post with a right footed shot from the centre of the box. Assisted by Luis Suárez following a fast break. Goal! Granada CF 1, Barcelona 4. Neymar (Barcelona) left footed shot from the centre of the box to the bottom left corner. Assisted by Paco Alcácer. Attempt saved. Jeremie Boga (Granada CF) left footed shot from the centre of the box is saved in the centre of the goal. Attempt missed. Paco Alcácer (Barcelona) right footed shot from the centre of the box is close, but misses to the left. Assisted by Neymar with a cross following a corner. Corner, Barcelona. Conceded by Matthieu Saunier. Hand ball by Carles Aleñá (Barcelona). Attempt missed. Luis Suárez (Barcelona) right footed shot from the left side of the box is too high. Attempt saved. Neymar (Barcelona) left footed shot from the left side of the box is saved in the centre of the goal. Attempt saved. Mubarak Wakaso (Granada CF) left footed shot from outside the box is saved in the centre of the goal. Assisted by Andreas Pereira. Goal! Granada CF 1, Barcelona 3. Ivan Rakitic (Barcelona) right footed shot from the centre of the box to the bottom left corner. Second yellow card to Uche (Granada CF) for a bad foul. Foul by Jeremy Mathieu (Barcelona). Adrián Ramos (Granada CF) wins a free kick in the attacking half. Corner, Granada CF. Conceded by Jeremy Mathieu. Uche (Granada CF) is shown the yellow card. Neymar (Barcelona) wins a free kick in the defensive half. Substitution, Granada CF. Isaac Cuenca replaces Gastón Silva. Andreas Pereira (Granada CF) wins a free kick in the defensive half. Attempt saved. Andreas Pereira (Granada CF) right footed shot from outside the box is saved in the bottom left corner. Attempt missed. Jeremy Mathieu (Barcelona) left footed shot from the centre of the box is close, but misses to the left. Assisted by Neymar with a cross following a corner. Corner, Barcelona. Conceded by David Lombán. Foul by Mubarak Wakaso (Granada CF). Foul by Paco Alcácer (Barcelona). Substitution, Barcelona. Andrés Iniesta replaces André Gomes.